I’m about to run off to Islay to do my 16th annual dinner for Feis Ile at the Port Charlotte Hotel. As ever, some of the whisky and food pairing decisions have seen me in agonies for some weeks but I’ve decided to go with my gut feel on the choices, in the end. Menu and whisky matches to be posted next month as the whiskies are always kept a surprise till that evening. Last month I mentioned I was trying to get into Whyte & Mackay to chat to Gregg Glass and Kirsteen Beeston about the new Jura expressions and we finally managed to get dates set up for May. The piece was posted only very recently and can be found in this same Notes section of The Whisky Ambassador website. A lot of exciting stuff to come from the Jura team in there. It was while I was in seeing Gregg Glass that I was introduced to Jon Purcell, photographer par excellence. 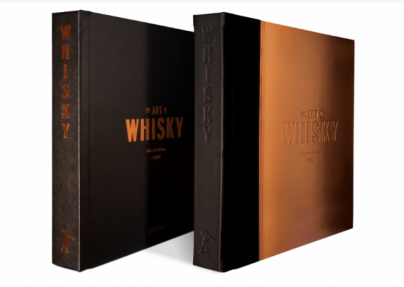 He has produced a book of whisky photography (not just Scotch Whisky), “The Art in Whisky” with a foreword by Richard Paterson, Master Blender at W&M. Indeed, Gregg had a copy handy to show me and oh, what a glorious piece of art it is. It was launched end of last year but this is the first time I’ve seen an actual copy. Jon has published the book himself under his company Spiorad (Gaelic for “spirit”) Publishing. He’s had interest from major glossy book publishers like Taschen and Assouline but he wants to keep control of sales and marketing himself so it’s for sale only via his website so he can create more lasting customer relationships. There are two editions, both limited – one bound in black leather and the other with a fine copper skin. Both are exquisite and the photography inside very atmospheric, printed on thick, high cotton content paper. As a piece, it’s very tactile. I’ve seen whisky photography books before but never one quite this beautiful. Do look on Jon’s website www.spioradpublishing.com to see more. The pic here is taken from the general internet and doesn’t do them any justice. Even the website is lovely. The downside – for most – is the cost. The copper edition (250 copies) is £1,250 and the black leather one (1,000 copies) a relative steal at £450. Jon’s ambition was to create something which might be considered an heirloom. Indeed, one whisky enthusiast has bought one for his baby son to give to him on his eighteenth birthday. Now that’s forward thinking. Others bought two copies one to enjoy and one as an investment piece. Appearance: Straw gold and very bright. Tears swift and close at first. Nose: Fresh, malty but a bit closed at first. Some barley sweetness and light fruit; touch of honey and barley sugar. Vanilla custard. Left a while there is more toffee/caramel ; sweet apple juice and a note of exotic fruit juice. Palate: some inital oak vanilla and honey sweetness; barley sugar sweets; warm, sweet spices. Oak brings up the rear with a dash of pepperiness. Finish: Quite long with vanilla sweetness, a white peppery zing and oak astringency. This one was matured in a combination of first fill US oak bourbon barrels and first fill Pedro Ximenez sherry casks. It’s rare to get a triple distilled whisky from up north. It was done at Benriach from 1998 and there was some remaining stock from that time which led Stuart Buchanan to start it again in 2006. It’s only a very small production that’s done in this way. 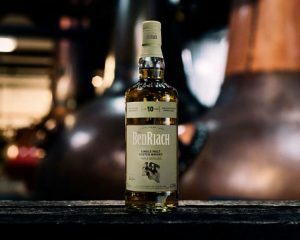 More on Benriach and its methods next month, if room, but I can’t stop without saying that, good though this is, the tasting treat of the visit for me was the Benriach 21 Year Old. Brilliant! 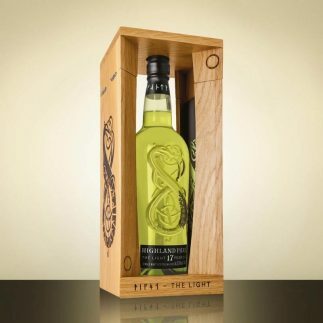 Second whisky tasted is Highland Park The Light. Been a bit of a wait for this one as there was a delay in preparing samples. The Dark came out some months back. While it was a brooding creature this one is much more sunny natured. Appearance: Medium, sunny gold with brass highlights. Tears are slow to form and quite sticky on the glass. Nose: Slight golden syrup and a hint of soft toffee/fudge; honey and spices; rich, malted grain,; pear juice; With water, slightly more fudgy and honeyed notes; a subtle touch of embers; walnuts. Palate: Luscious and slightly oily mouthfeel; some wisps of smoke and warm honey; toasted ceral and wood; licorice, nuttiness and oak astringency from tannins. Finish: Long, sweet and nutty with licorice and soft toasted wood then oakiness and dry. Till late June with Benriach, Islay dinners and more, enjoy your summer drams.